A traditional Indonesian scalp massage. Carefully relieving the stress of the scalp by applying pressure, stimulating the pressure point of the scalp while applying nutrients from out rich treatment cream. By removing dead skin cells from the pores of the scalp will increase blood flow and will revive our customer’s lively, beautiful, elastic hair. Relaxing the scalp and tighten it will lift-up the face, and relieving migraine caused by stiffness and eye soreness. Menu that draws the most attention from the computer related jobs society nowadays. We are using the best treatment cream from Martha Tilaar, Indonesia`s largest cosmetic company. Reviving the hair and the scalp to their original healthy and beautiful condition by using our full of natural ingredients products. Our customer can choose from 4 kind of rich smell cosmetics according to the quality of their hair. Using the palm, fingers, and plenty of aroma oil, while applying moderate yet strong pressure, relieving the stiffness of the muscle and body calmly. Leading the body and soul to a relax state, by using pleasant stimulus and smell. The characteristics of Balinese are careful rhythmical long stroke hand technique. Applying pressure of 20Kg relieving all the stiffness to the deepest part of the body, from shoulder to toes completely. Increase the blood flow and adjust the flow of lymph, enhance the metabolism, reviving the beauty and vitality our customers originally had. DEWI SRI SPA is a special skin care series with variety of purposes, for instance, whitening, moisturizer, slimming, damaged skin cure. Made with the combination of rich nutrient rice extract, and essential oil to take care of the body. Feel free to use it at your home. 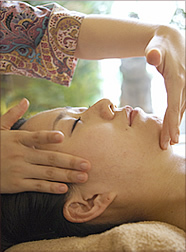 Balinese facial massage uses the luxurious all hand massage. With the delicate touch of the hands, relieving muscle stresses and stiffness that will cause dullness and bags under the eyes, work straight towards the cells inside it. By moving the muscles that are not often used, will have a lift-up effect, improve the turnover of the skin, increase in blood flow and metabolism. For drier skin customer, we will increase your dead skin excretion, leading you to moister skin. For oily skin customer, we will adjust your dead skin excretion, leading you to clearer and smoother skin. Carefully chosen plants ingredients will stimulate the beauty force of the body. [SARIAYU] skin care series made by adjusting to the skin of Asian women, has clear color tone and unique smell that will give those effect. We made variety of the series, that will suit variety of skin. Our customers can use it for everyday use. A type of treatment done from the toes to the lower back. Using Balinese characteristics massage, deep and strong, to carefully massage, leading to a better excretion of waste products. Pressing the worrying edema and cellulite, enhance the metabolism and blood circulation. Preventing edema and cold by bad blood circulation. In our slimming massage course, we are using body contour oil to apply pressure, to relieve the muscle stress. By moving the muscle, we accelerate the fat-burning process, leading to neat and beautiful legs from the synergy of our aroma oil.